The Fantastically Mundane Tales of SquirrelHead: It's Movember!! First, DC Rainmaker is giving away a Garmin Forerunner 210 this month. Follow the link to find out more. I am participating in Movember this month. The Mo, slang for moustache, and November come together each year for Movember. The idea is to start with a clean shaven face and grow a moustache throughout the month. The fun is to decide what style you want to grow. Do you try to grow a Magnum PI moustache or maybe a fu manchu. The choices are endless (sort of). 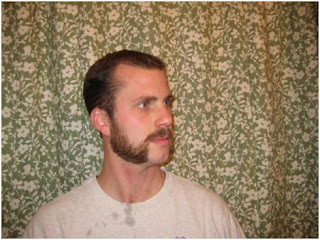 I am thinking about growing a civil war style like the picture below. I am sure at the end of the month it will be pretty sweet. The point of something like this is that it attracts more attention than a regular moustache. I will get more inquiries about my moustache which gives me more opportunity to raise awareness (and hopefully funds) about prostate cancer which is the number one cancer affecting men. The funds that are raised go to benefit the Prostate Cancer Foundation and LIVESTRONG .